United Church Meadow sign with additional note about the need for dogs to be on a leash in the area. A year-round shelter and outreach centre on Salt Spring would serve people experiencing homelessness and help mitigate islanders’ concerns about use of Ganges parks, according to initiators of the proposed new project. Though it will not solve the problem of homelessness on the island, the group hopes that giving people a place to sleep and offering programming will help with some of the issues that arise when community members are unsheltered. Initiated by leaders of some island church groups, the plan is to raise funds to purchase the Salt Spring Metal Recycling property at 251 Fulford-Ganges Rd., which is listed for $800,000. 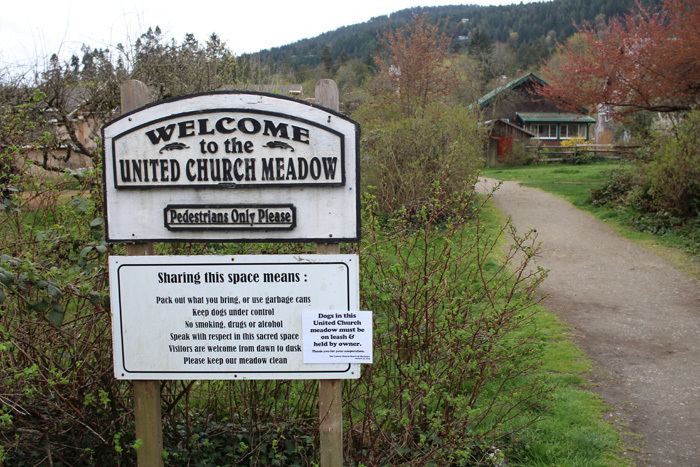 While the church organizations themselves still have to sign on to the idea, Salt Spring United Church Reverend Chris Levan hopes that converting the site to a year-round shelter will help address community concerns about homeless people’s use of the United Church meadow on Hereford Avenue. The seasonal shelter run by Salt Spring Community Services with provincial government funding provides a spot for people to sleep and an evening meal from November through March each year. “We got together and felt there was desperation in the community because the shelter was closing, and that’s where the idea began,” Levan said. Looking for a solution, they felt that the metal recycling property recently put on the market could be a potential solution. The building is structurally sound, has access to water and the potential to tie into the Ganges sewer system. It also has a large open area adjacent to the building, which would provide a place for shelter users to gather, opening up parks and other public spaces for other community uses. Some residents have reported being uncomfortable using the park or even walking through it, particularly after someone was bit by a dog there, which prompted a new rule to keep dogs on leashes. Sarah Hamilton, who runs a law practice from an office across the street from the site, said she and others in the neighbourhood have been harassed in the area. Hamilton agrees with the year-round shelter option and that providing a space for everyone to congregate is in the best interests of the community. “I’m not advocating for a wholesale ban on people hanging out in the park. It would be really helpful if other people could still use the park,” she said. The new shelter is still an idea, with a long way to go before possibly becoming a reality. The first fundraising effort is to collect pledges of at least $1,000. Then the building will need to be renovated, rezoned and approved before it can open. Levan thinks the sooner it can happen, the better.